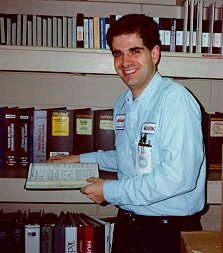 Mark Giammalvo is customer relations manager and driveability specialist at his family business, Sam Giammalvo's Auto Sales & Service, Inc. in New Bedford, MA. Mark, who has been with the business for 20 years, is an ASE Master Automotive Technician with L1 certification, member of the Society of Automotive Engineers, and holds an associate degree in business management. He describes the family's 8-bay shop, which has been operating for over 40 years, as the "last stop for cars with tough driveability problems." Mark's brother Glenn is the shop's service manager. to be the bearer of bad news but you'd better think again. As a Master Automotive Technician and 18 year veteran of the automotive repair industry, I have noticed that our modern day automobiles are getting both better and worse. Like many other automotive technicians, I am now attending more than 90 hours a year of technical training in order to keep up with the ever changing technology on new models that the automobile manufacturers are bombarding us with annually. In addition to that training, there are also classes to attend so that we know how to properly use our shops electronic diagnostic equipment. All this training and technology is great, however, it won't help to diagnose a vehicle with an intermittent problem, if the problem is not present during testing. A little background: We see less and less mechanical failures today. Engines and transmissions are lasting longer than ever. The large amount of failures we see on today's vehicles are electronic. Namely the sensors, wiring and computers. I use the plural, computers, since most vehicles today have anywhere from one to eight. We refer to all this electronic gear as "transparent technology" because the majority of the motoring public is unaware of all these components hidden in their vehicles. After all, it isn't visible without disassembling a portion of the car, so, out of sight out of mind. Although the average vehicle can keep running if some of the onboard electronics fail, there is still a large majority of electronics that, upon failing, will render the vehicle inoperative. For the past several years now we've been seeing a pattern of intermittent electronic failures. In plain English, it's when a car suddenly quits running, then five minutes later, can easily be restarted, then runs fine for the next day, week, or year. When your car develops an intermittent electronic problem like this, you and your automotive technician are in for a new lesson in patience. If the problem lasts long enough for us to complete our diagnostic testing, we can find the faulty component, sensor, wire etc. However, if the problem disappears and corrects itself before or during testing, all the training and diagnostic equipment in the world isn't going to find or fix anything. The reason is that, the problem, let's say for example a circuit board that has a small crack cutting through the electronic circuitry, has corrected itself by the vehicles vibration or by contraction and expansion from temperature change. The crack is still there, but contraction has reduced the cracks gap enough that the component can now work normally again. If you test something that's working normally, the test results will not find a problem, since at that moment, the problem is gone. This is actually a common occurrence with faulty sensors, circuit boards, and wiring. Remember, the electronics in an automobile are subject to a high degree of vibration and temperature variation. I'll bet if you slapped four wheels on your TV or VCR, sent it down a few bumpy streets, and put it through hot and cold temperatures, it wouldn't last a week. That being said, how can we expect the electronics in an automotive environment to perform flawlessly for the life of the car? More and more often, cars are being towed in that quit while running, leaving the owner stranded somewhere. Many times, right after the tow truck drops off the car, I hop in, turn the key, and the car starts immediately. A subsequent test drive reveals a well running car with no problems. Connecting our diagnostic equipment to the vehicle's computers reveals the message: "no codes present, no faults present in memory." A visual under hood inspection of the vehicle's visible electronics does not reveal any obvious problems. At this point we will look up any service bulletins that apply to this model vehicle. If none are found to address this type of problem we take a second test drive. If the car is found to still run fine, I know I most likely have the dreaded intermittent problem. I call the customer and advise them to pick up the car. I total the customer's invoice and write: "unable to duplicate fault condition, no problems found, the vehicle will have to be symptomatic in order to diagnose." The old saying used to be: If the cars not broken don't fix it. The new paradigm is: You can't fix a car that's not broken. This has got to be one of the hardest things for an automotive technician to explain to the customer. Sometimes the customer will respond with: "So you don't know how to fix it?" or "How come you can't figure out what's wrong?" When this happens, the technician is left looking like a dummy. In reality, he has been handed a car that is running well and is supposed to find something wrong. Sometimes a technician will replace a part that could cause an intermittent problem in an honest attempt to repair the car. The problem is, there are just too many parts on today's cars that could fail intermittently. If a technician does replace a part on a hunch, he faces the embarrassing possibility of the customer breaking down again. If that happens the customer is even more upset because they paid for a repair and the car has been found to be symptomatic once again. Now the customer definitely does not want to pay a second time to diagnose the same problem. This is why most technicians today would rather only recommend replacing a part if they can actually prove it's failure through testing. Strangely enough, people will tolerate a "come back" situation like this more in the medical industry. Case in point: You complain of pain and seek out a doctor. The doctor recommends some testing, some x-rays and the like. After the test results are in you are given a prescription. You, (or your insurer), pay your bill and you leave. A week later you are still experiencing the pain. The doctor recommends more testing. Now you are given a different prescription. You pay again. A week later the pain is still present. The doctor may recommend a more invasive procedure like exploratory surgery to gather more test data. You pay again. It's actually not the motorist's fault that they don't understand. The motoring public is more familiar with the simple problem of a part on their vehicle failing permanently than the frustration of a car that has a part fail intermittently. Although I make my living diagnosing and repairing cars, I never wish car trouble on anyone. But if you do have a car problem, I just hope it's not an intermittent.